Okay! Musume Time: Help Make Idol Matsuri 2015 Happen! Phase 1: Securing That Venue! 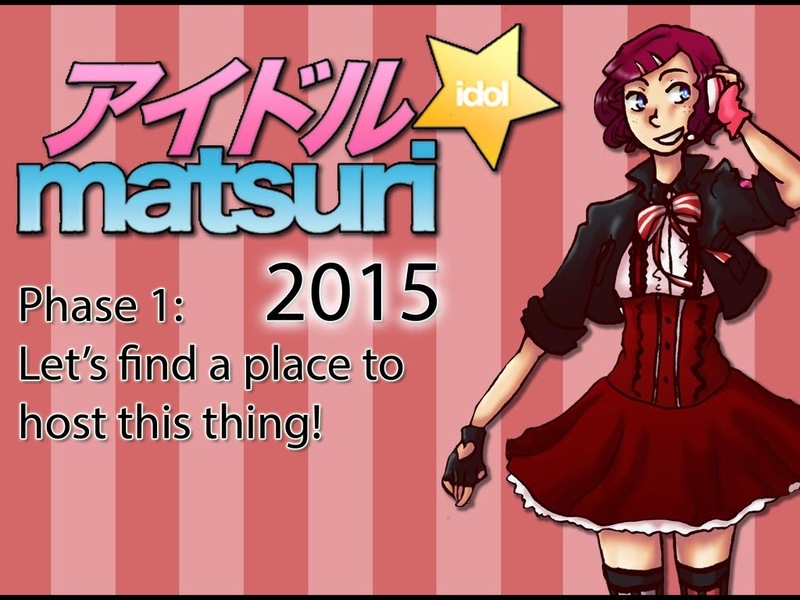 Help Make Idol Matsuri 2015 Happen! Phase 1: Securing That Venue! Last year, Idol Matsuri held their first event in the United States, and brought to the fans of the Japanese Idol scene Aither, RYUtist, Halko Momoi, SHEawase, Ally&Sally, Beckii Cruel, Beri! New Day and DJ Amaya. With the event being a big success for its first year, of course the team behind Idol Matsuri are once again aiming to bring the Idol-themed event back for another year. Of course, this does not come without problems. Idol Matsuri is still very much new, and with their second event planned for August 2015, the Team hope to improve on Idol Matsuri as well as what it provides for the fans and those performing. One of the things that they hope to improve on the most this year happens to be the location. Last year, Idol Matsuri was held at Silverdale, which proved to be a little inconvenient for both guests and attendees, so this year, the Team behind Idol Matsuri hope to secure a venue in the Seattle-Tacoma area, which would allow for much easier access and also the possibility for more fans to attend the convention and to experience the true energy and feel of Idol Matsuri. This is where the help of the fans and those who hope to attend comes in. With Idol Matsuri 2015 underway, the Team are currently putting together various campaigns, with one of the most important being the fundraiser to secure their venue so that this convention can happen. So, to help them on their way with the fundraiser, the Team has put together a Kickstarter Campaign (which you can find HERE as well as in the Source links below) which will help them to raise some money for the venue's deposit. Currently, their target goal is $600 - this seems like a lot, but if everyone puts in even a little bit towards this campaign, then I am sure that it will not be hard to hit. Of course, for what you give to help fund the project, you do get a little something for giving to the cause - there are Rewards involved, of course, with some of the highest of the Rewards being VIP badges or Vendor Booths. With the smaller Pledges, the rewards are still pretty sweet; you can have your name printed in the program guide, as well as get a photo-card of the events mascot, Kurumi. With this fundraising system in mind, Bethany (Event President) and Melissa (Marketing) have made it so that the fans who donate will be able to secure the best possible prices for those who get in there fast, making it as cheap as they can for the sake of this fundraiser, and the sake of the venue they will possibly secure. This Kickstarter will not be around for long - it ends on February 15th in the US, leaving only a week or so until it fully closes. This is an event that I am sure a lot of people want to happen, especially those behind the scenes that made it happen last year, and saw it become a success. Currently, it is the venue and the deposit that is the biggest risk right now - without that deposit, Idol Matsuri 2015 may not happen. In order to bring more acts to America, whether they are Western or Japanese Idols, both of which Idol Matsuri hopes to bring to the event once again this year, then this fundraiser NEEDS to happen, and the venue needs to become a reality. This is something that they hope to improve for Idol Matsuri this year, an improvement that will allow the event to be more easily accessible for both the fans and artists, and one which can house more fans than Idol Matsuri brought last year, and hopefully in the years to come. With your help, this can happen. So please, if you can, help out the Team behind Idol Matsuri and give a little to their cause. This Venue is the ticket to Idol Matsuri 2015, and without it, the convention may not happen.